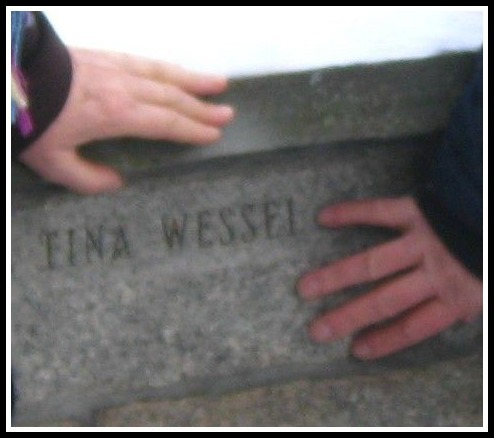 A year ago, Westport said goodbye to Tina Wessel. Over 150 people gathered in Christ & Holy Trinity Church to mourn the homeless woman who for years had limped around town. She died — alone — in a shed she frequented near the Senior Center. 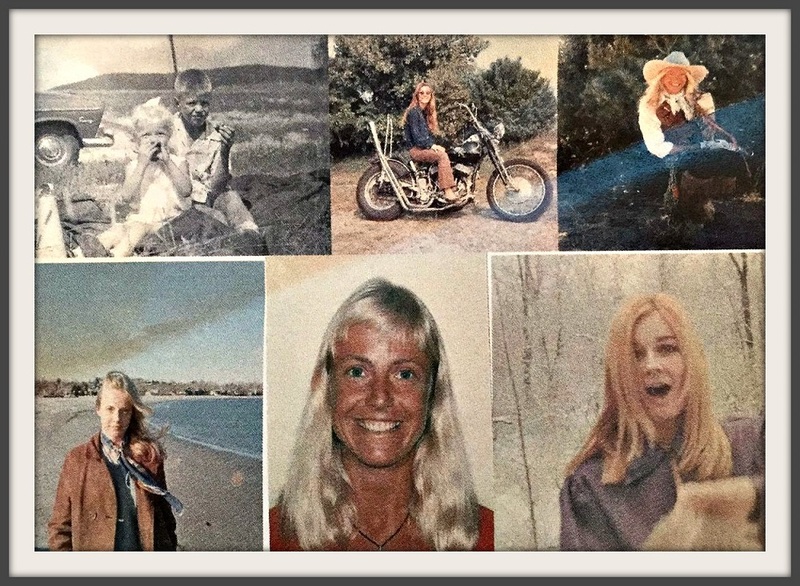 Photos of Tina Wessel, from her memorial service. 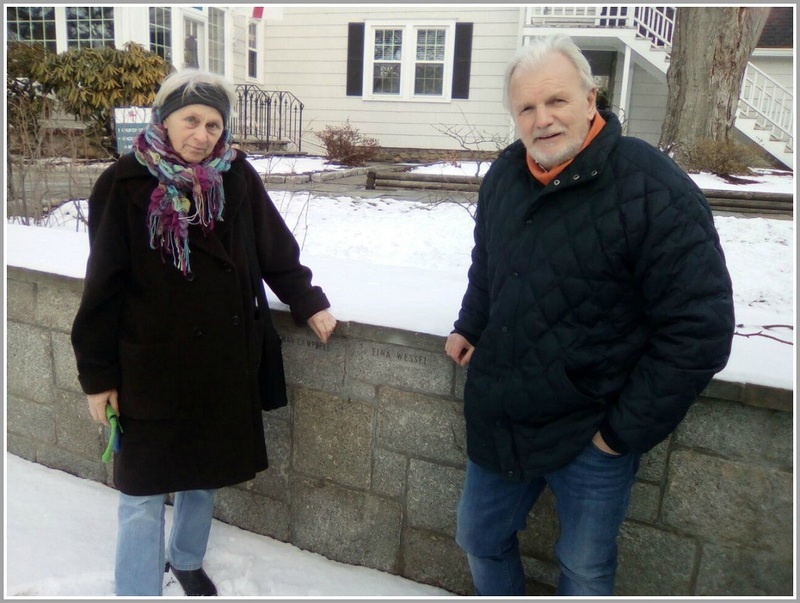 A few days ago, Westport welcomed Cornelia Kunzel and Rolf Rabe. They live in Germany, and are Tina and Ludy Wessel’s first cousins. Ludy — Tina’s brother — died in 2012. Cornelia and Rolf came to see where their cousins had lived. They wanted to meet Tina and Ludy’s friends and acquaintances; thank Human Services, and give a donation to Homes With Hope. Cornelia Kunzel and Rolf Rabe at Christ & Holy Trinity Church, where Tina Wessel’s ashes are interred. Accompanied by Ellen Naftalin (who helped Tina) and Larry Ritter (a close friend of Ludy’s), they traced Tina’s frequent routes through town. They saw the shed she called home, and toured the Senior Center nearby. They had lunch at Rye Ridge Deli — the new downtown spot that replaced Oscar’s. Late owner Lee Papageorge always fed and looked out for Tina. They visited Christ & Holy Trinity Church, where Tina’s ashes are interred. And they drove all around Westport. At the end of their meaningful day, they watched the sun set — crimson red — over Long Island Sound. This entry was posted in People, religion, Restaurants, Westport life and tagged Christ & Holy Trinity Church, Cornelia Kunzel, Rolf Rabe, Tina Wessel. Bookmark the permalink. I do remember Tina in my classes in Weston schools, in the 1960’s. Her tragic story and beautiful photos here still resonate with me. That was a really interesting article you wrote, Dan, about Tina, last year. Thanks for this follow up! I feel like there’s a movie to be made, in this story/history of a “rogue” woman at odds with her past affluence, and her subsequent individual “choices”. Not sure why, but I get a Sylvia Plath (Bell Jar) vibe, when I read about Tina … not directly or literally … just a hint of some sort of inner dialogue that might align with a woman who doesn’t fit the societal mold.